When is your work not your work.???….. or at least, when does it not look like your own work? And how much should that bother you?? It’s a question I’ve been pondering. Recently I stumbled on an image of an artwork from the 1960’s that I had never seen before, but it bears a striking resemblance to some of the work I have been made . . . . in fact I found this image because I started digging after seeing another sculptural piece that I found really inspiring. Here is the work I found that is scarily similar to mine (similar - but not the same, and that is the key point here ) - this is by Mary Martin, from 1963. And here is some of my own work . . . . you see what I mean by strikingly similar?? I can see why someone might accuse me of ‘copying’ her work (no one has, but I could see why it might happen). But I swear I have never (to my knowledge at least) seen her work until now. In fact, since discovering her I’ve bought a small book about her and she is a very interesting artist, who only practiced for about 10 years after raising her family, and before dying at a fairly young age. Her work was very systems-based, unlike mine, and yet our end results have similarities. 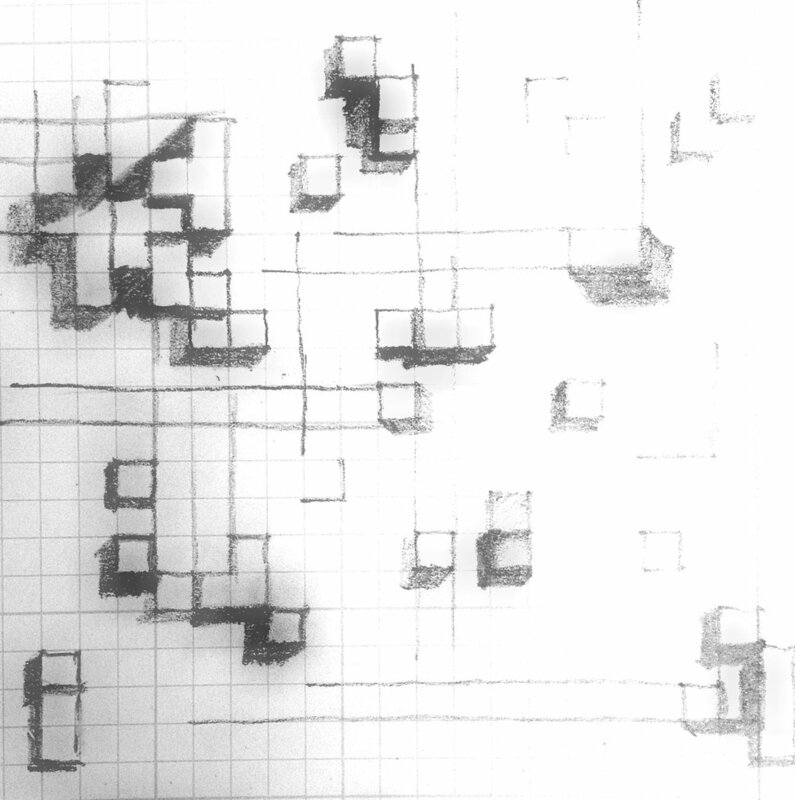 A quick sketch I made from a video of a moving wall - read more about that in my previous blog Inspiration from unusual sources, to understand the completely different way that I came to be creating work that is quite similar. Foam card mockups that I made after being inspired by a video (see this blog post here for more about that inspiration). I lit these to create shadows, which then became paintings. A couple of these paintings are shown in the image below this one. My own work (card mockup, ceramic wall-piece, paintings), inspired by shadows falling on white forms. My first reaction was to be bothered by the discovery of the Mary Martin artwork and to feel as though my work was somehow no longer original or completely valid. But then I remembered the book by Austin Kleon titled ‘Steal like an Artist’, and another book he wrote called ‘Show Your Work’. Austin Kleon is known, amongst other things, for what he calls his ‘newspaper blackout’ poems. There is a section in Steal Like an Artist that explains how nothing is totally original, we are all influenced by all the things we have seen in our life, and everything and that has gone before. Austin Kleon explains how he was once accused of copying an artists work, even though he had never seen it before and had come to what he did via a different means. He started writing poems using old newspapers and the concept of redacted CIA documents. But it turns out he was not the first person to use a similar technique - in fact after being accused of copying Tom Phillips (who did something similar (but different) in the 1960s) he did some digging and found that since the very beginning of newspapers (for 250 years, since the first-ever print newspapers) people had been doing ‘similar’ things - similar, but all slightly different. And just because someone else has done something similar doesn’t mean that what you are doing is any less relevant or personal. In fact Austin Kleon points out that the best artists ‘steal’ influence from others, then alter the ideas and combine it with other influences into their own unique ‘thing’. 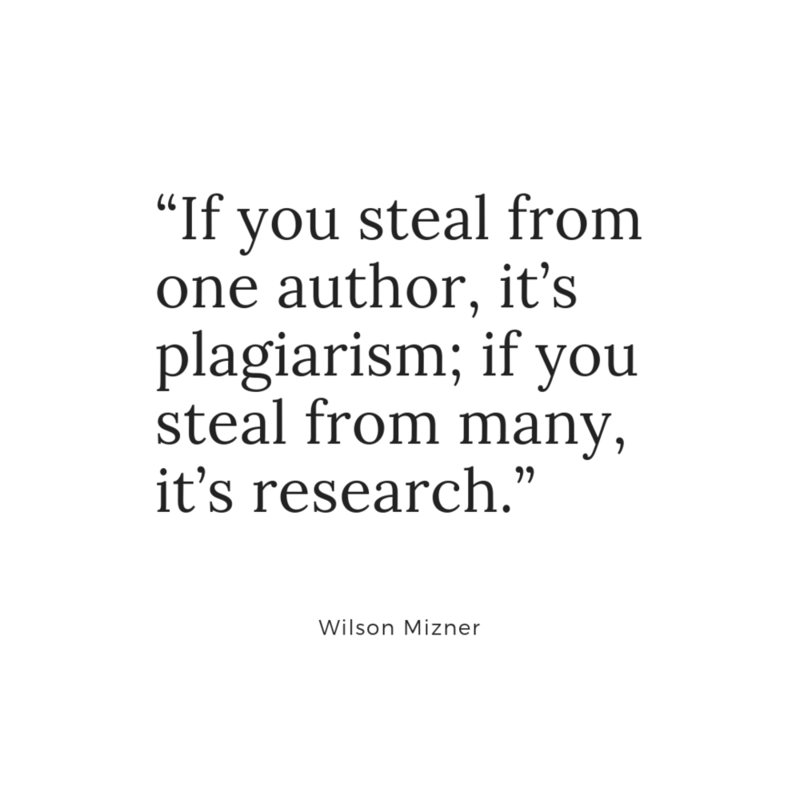 And that is the key - not ‘copying’ or imitating, but transforming and remixing. Not stealing from one, but stealing from many. Picasso seems to have agreed! Here is a link to a Ted talk By Austin Kleon, titled ‘Steal Like an Artist’, if you are interested to find out more. 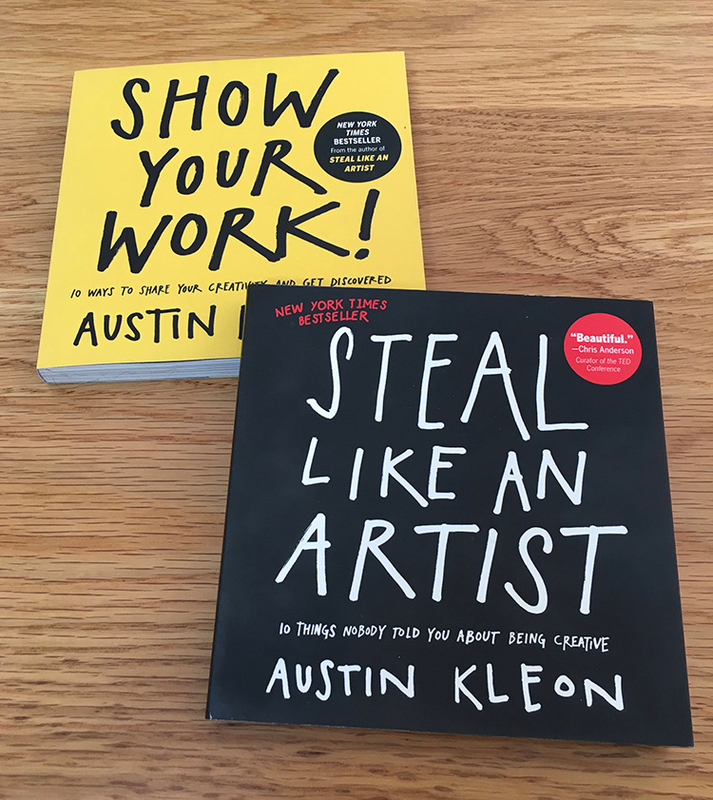 You can buy Austin Kleon’s books here. And here is a link to Austin Kleon’s website if you are interested in reading more about his blackout poems, or about him and his thoughts on creativity. ‘Steal Like an Artist’ and ‘Show Your Work’ were actually what tipped the balance and gave me the confidence to post my first ever Instagram post of my art. I’d never had an Instagram account before that, and I didn’t tell anyone I knew that I had set one up (it was a couple of weeks before I even told my own family!). I just took a deep breath, hit post, and then hid my phone for the rest of the day quietly hoping that no-one I knew would see it and that no-one would leave any mean comments! It turned out that a few total strangers from the other side of the world ‘liked’ my post - and that gave me increased confidence to post more. Within a few weeks I had total strangers following me! I couldn’t believe it. And now I have made new friends all over the world, have found the most open and sharing community of artists who will discuss technique with me and share tips and failures, and I now have new real-life artist friends in NZ who I originally met just by chatting on Instagram. . . . so I really have Austin Kleon to thank for all that. Here are just some examples of some of the very many images I have collected that inspire what I make. I have a big collection of images, and when I’m looking for inspiration I’ll flick through them. Something will spark a thought and then it will be influenced by other images and a new idea will emerge . . . then I’ll tweak it some more - and it may or may not end up becoming a new painting. 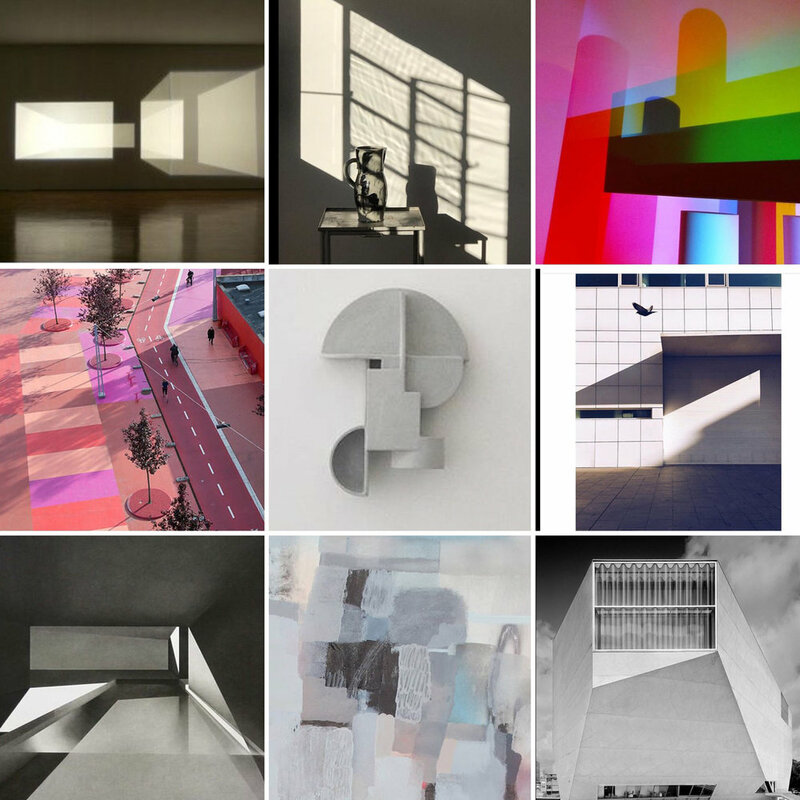 I use Pinterest and Instagram to save images that inspire me in some way - some images have a colour palette that I like, other times it’s a building or object casting a shadow, or a shape that might be inspiring as part of a painting. . . . often I won’t really know at the time why I like and image, I just have a feeling it might spark an idea later so I save it. If you are interested to see things I save for inspiration on Pinterest, there is a link to my Pinterest boards at the very bottom of my website. A footnote - if the question of influence vs straight-out copying interests you, you might be interested to follow this instagram account (@whos____who) which posts some pretty fascinating images, and sometimes equally interesting discussion in the comments about the images posted. I certainly hope to never make it on to their page - although having read Steal Like an Artist I don’t think it would cause me the same angst and self-doubt that it might have done previously! Sign up to my mailing list and I’ll let you know when I add new articles.